If you’re going into nursing education, then getting Certified Nurse Educator certification may be a step you want to take. The certification establishes the field of nursing education as a way for nursing faculty to demonstrate their expertise. The National League of Nursing provides the certification, which has been granted accreditation from the National Commission of Certifying Agencies. As with any exam, there’s a lot to know the ins and outs of taking the test, and this guide will help you with some of the most commonly asked questions. 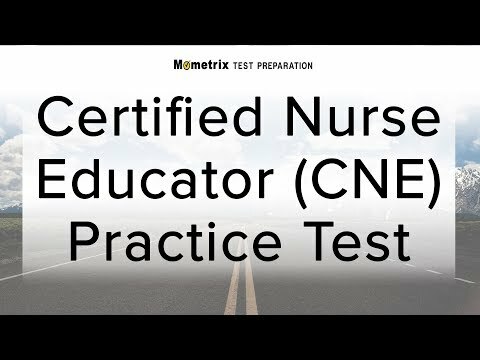 Can anyone take the Certified Nursing Educator (CNE) exam? Option A: Candidates must have a currently active registered nurse designation in the country where practicing as a nurse educator, and hold either a master’s or doctoral degree in nursing with either a major emphasis of nursing education; a post-masters certificate in nursing education; or at least nine credit hours of graduate-level education courses. Option B: Candidates must meet two of three requirements — be actively licensed, just as in Option A; holds a masters or PhD in nursing with an emphasis on roles other than nursing education; or be employed at least two years out of the previous five in a nursing program at an academic institution. The eligibility requirements can’t be waived. Are there fees to take the test? Yes. The test costs $400 for National League of Nursing (NLN) member, and $500 for non-members. If you have to re-take the test, the fees are $350 for members and $450 for non-members. These fees are for testing within the United States. Those fees will be forfeited if the candidate shows up more than 15 minutes late for an exam; fails to show up for an exam; wants to reschedule but fails to do so at least two business days prior to original exam date, or tries to reschedule the exam a second time. Five years. It can be renewed by fulfilling professional development requirements or by taking the CNE exam. Involves teaching strategies, technology to support the learning process, effective communication, fostering a positive learning environment, acting as a role model in a practice setting, and more. Includes identifying learning styles, resources for culturally diverse learning styles, advice on meeting professional goals, engaging in peer evaluation and more. Focuses on nursing program standards, learning assessments, various other assessment strategies, and more. Includes curriculum development, including identifying outcomes, selecting appropriate learning activities and clinical experience; course and curriculum design; curriculum revision; program assessment design, implementation, and evaluation; and other topics. Includes questions about professional development organizations and opportunities, using feedback, mentoring and support, and more. Includes how to function as a change agent, increasing the visibility of nursing, leadership skills development, culture and change, and more. How many questions are on the CNE? There are 150 questions on the test, or which 130 are scored. The other 20 are unscored and are being tested for future exams. How can I schedule a test? You can schedule your test online or by telephone. There are a number of testing centers across the United States. Do I need to bring identification the testing center? Yes. You must be two forms of identification and one must have a photo. Can I bring electronic devices into the testing room? No. Any device that could be used to record any part of the exam — including cell phones, pagers, tape recorders, cameras, and the like – and prohibited. Calculators are also prohibited. Personal items also aren’t allowed in the testing room, and all personal items will be locked in a locker. How long is the CNE examination? The Best Way To Study For The CNE! When will I find out if I passed the test? Candidates will receive their test score on site. The test is pass/fail, with the passing grade determined by the raw score of correctly answered questions. If you fail, you can retake the exam once every 90 days. Can I get a refund of my testing fees if I decide not to go ahead with the test? All refunds are at the discretion of the NLN, which applies a non-refundable $100 registration fee to all candidates. Overwhelmed? Don’t be. Mometrix has a number of tools that can help you study for the CNE. Our comprehensive study guide has been researched by a team of professionals with years of experience helping educators prepare for exams just like this one. The guide provides specifics on how to tackle the questions you’ll be asked, and if you’re stumped, you can ask one of our experts for help. And, if you’re worried at all about buying the guide, don’t worry. We offer a 100% risk-free, money back guarantee. Our large, easy-to-read flashcards help you learn through repetition, and the questions cover every content area of the exam. Not only that, the cards make it easy for a friend or relative to help quiz you on the questions you’ll need to know to pass the CNE exam. Mometrix Academy is a completely free CNE certification resource provided by Mometrix Test Preparation. If you find benefit from our efforts here, check out our premium quality CNE study guide to take your studying to the next level. Just click the study guide link below. Your purchase also helps us make even more great, free content for test-takers. Our customers love the tutorial videos from Mometrix Academy that we have incorporated into our CNE test study guide. The CNE study guide reviews below are examples of customer experiences. I purchased the CNE Exam practice questions test preparation book. I love the rational at the end of the book for the answers provided! Font size and organization were well done. I also really enjoyed the fact that the practice test were both about the same number as actual exam to help with time management. My rating for this product is 5. I find it easy to carry with me and continue to have the opportunity to study when I have a break/time slot in my schedule. I had the opportunity to browse through the book and the content and level of questions are along the educational knowledge of a nurse educator. The book has a broad range of question that exams the knowledge base and clinical skills. This CNE exam book will allow me to study and be successful taking the exam. The practice questions help me to focus on what I need to continue studying. The study guide provides concise information. The Flashcards help tremendously!! 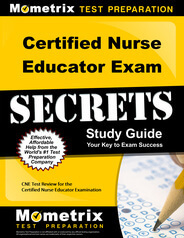 I have enjoyed the easy to read and concise information on how to prep for my upcoming CNE exam. I’m excited to learn and look forward to my exam. I truly believe your product will help me reach my goal! I purchased the secrets study guide about 2 weeks. I have already completed it and am glad I did. It breaks all of this information down in simple pieces. I passed the CCRN many years ago. I find preparing for this CNE exam to be quite difficult, more so than the CCRN. I appreciate your study guide. After comparing the dozens of study guides out there, this one seems to be the most comprehensive of the bunch. Upon arrival, I was able to examine the book. I particularly like how it breaks down disease processes to include rationale for treatment. It truly explains the “why” for every question asked. Great study guide, short topics, to the point, hits the highlights. Quick read in between tasks. I can hit a certain subject and within a few minutes have it covered, and then come back for another. I have heard excellent things about the book. So far I agree! It is an excellent review and easy to understand and follow. I will continue using this book to prepare for my CEN. I am a clinical nurse educator and will encourage my fellow nurses to purchase this book. Your book helped me a lot to regain my knowledge. I know I will pass the exam with flying colors. I like the presentation of the book because it is easy to understand and simplified, highlights the salience points. I took my CEN exam yesterday and passed!! I used this book as my primary source of studying and there were specific answers I remembered during the test from my reading of this book. Great practice exam in the back and highlights great topics.